The PADI Open Water Diver course is the world’s most popular dive certification. Millions of people have learned to scuba dive and discovered the wonders of the aquatic world through the PADI Open Water Diver course. Hundreds and hundreds of thousands have gone on to dive the world, learn more, do more and discover more. Hundreds of thousands have gone on to become PADI Dive professionals. And many thousands have gone on to own their own PADI dive center. 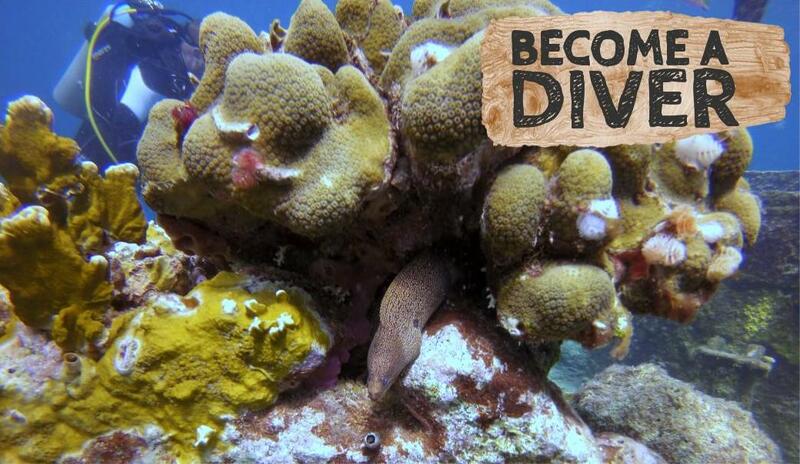 So be warned: this dive course could seriously change your future vacations – and your life! … then yes, you can enroll in your PADI Open Water Diver course (or Junior Open Water Diver course if you’re less than 15 years old). Learning and understanding the basic principles of scuba diving. Choose to do this before you come to Curacao or once you’re here – see Can I start right now? further down this page. You’ll learn your scuba skills in the protected shallow area of the bay, before heading out to the reef for your Open Water dives. Whilst enjoying the stunning underwater world of Curacao on the beautiful Dive Bus reef, you’ll practice your new-found scuba skills again. What will I be certified to do? You’ll receive a temporary certification card as soon as your Dive Bus instructor has signed to say you’ve finished the course to prove that you’re a certified PADI Open Water diver. Your full PADI certification will be with you within 12 weeks, or request an e-card that you’ll never have to remember to bring on vacation. Obtain air fills, rent or purchase scuba equipment. Take the next step whenever you’re ready to continue your dive adventures, such as diving deeper or diving at night, on your PADI Advanced Open Water. Download and check out the Medical Statement to ensure you have no contra-indications for scuba diving and that you’re in reasonable physical health. PADI eLearning Open Water Diver is a web-based learning system. Choose the eLearning option if you’re always online, or download the Touch app to your tablet so you don’t need to be online. Study when you want, at your own pace, before you come to Curacao, so you’re ready to complete the rest of the course with us in just 2 days (leaving more time for diving, once you’re a certified diver! BOOK YOUR OPEN WATER COURSE NOW! Complete your learning AND your confined dive sessions with your local PADI dive shop back home, and take your 4 Open Water training dives with us here on a beautiful reef in sunny Curacao, over 2 x half days. No worries. If you’d prefer to check out diving before you commit to taking your PADI Open Water course, start with the PADI Discover Scuba Dive and see how you get along. Like it? Great – the Discover Scuba Diving experience is the first part of your Open Water course, so just keep going! BOOK YOUR DISCOVER SCUBA DIVE NOW! 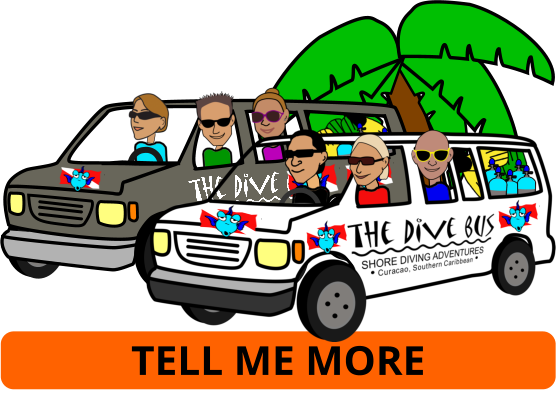 Jump on board the Dive Bus and dive the best of the rest of underwater Curacao with us. Prefer to improve your scuba skills a bit more? Become a certified PADI Advanced Open Diver in two additional fun-filled days. Would you LOVE to know what you’re looking at underwater – in just 2 dives (half a day)? Check out the PADI Naturalist Specialty course.